Located at the northwest entrance of William H. Gates Hall, this sculpture was created by the artist to honor her father, William Phelps Totten, and her brother, William McCormick Totten. The work was made available to the Law School partly as a gift of the artist and partly through a generous grant from the School of Law'sGraduate Program in Taxation. Doris Chase is a prominent national and international figure whose works are also in the collections of the Museum of Modern Art, the Smithsonian and many other public institutions. A statue by world-renowned sculptor Akio Takamori has been installed in Gates Hall on the second floor in the alcove above the GSB Student Commons. Beyond its importance as a work of art, this piece is of special interest to the history of the School of Law. The statue is a seated figure of a member of the University of Washington’s second graduating class, Mr. Takuji Yamashita, class of 1902. Though graduating from the Law School and passing the Washington State bar examination, Mr. Yamashita was denied admission to the bar on the grounds that a Japanese national could not become a U.S. citizen. Without an ability to gain citizenship, Mr. Yamashita was not eligible for Washington State bar membership. Mr. Yamashita ultimately took his challenge to the constitutionality of the principle that Japanese citizens could not become US citizens, to the US Supreme Court—unfortunately, he lost. Denied his chance to practice law, Mr. Yamashita became a businessman and social activist. In 1941, he and his family were sent to internment camps. Because of the internment, he and his family were unable to pay taxes or installment on their debts. They lost their home, their business and their farm. After the war, Mr. Yamashita ultimately returned to Japan, where he died in 1959. In 2001, the University of Washington Law School, the Washington State Bar Association and the Asian Bar Association of Washington successfully petitioned the Washington State Supreme Court for Mr. Yamashita’s posthumous admission to the Washington Bar. As part of the general celebration of the righting of this wrong, Mr. Yamashita’s grandchildren and great grandchildren donated $65,000 to endow a University of Washington Law School scholarship in international law and human rights. The statue is a gift of Professor Akio Takamori, the artist. Professor Takamori is a distinguished member of the University of Washington Art School faculty. He was trained in Japan and later in Missouri and New York. He works in porcelain; his artistry is a blend of eastern and western influences. Using black lines reminiscent of Japanese Wood block prints, Takamori’s work shows an intense interest in the expression of the human form. 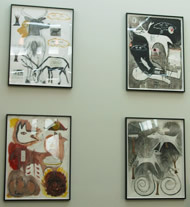 His work can be found in public collections in the US and around the world.